There’s a reason why no one has ever tried to base a stand up show on the books and diaries of an early 19th century Danish philosopher: it’s a ludicrously hard thing to do, something that even Simon Munnery admits, saying that as comedy material goes it rates about 8.5 on the difficulty scale. Kierkegaard considered to be the world’s first existential philosopher, isn’t known for his accessibility, so Munnery has to spend a good fifteen minutes explaining who he was, what he’s known for and who he did – and didn’t – get on with in his home town of Copenhagen. It’s extremely interesting, but not particularly funny. If the BBC are looking for someone to front a really good documentary about Kierkegaard on BBC4, Munnery is definitely their man. Once we’ve all received a good grounding in the life and works of Kierkegaard (spoiler alert: he wore cashmere trousers and his mother was originally his father’s maid), the show perks up and Munnery has a chance to do what he does best: do a spot on impersonation of Michael Caine. OK, that isn’t actually what he does best, but he is very good at it. 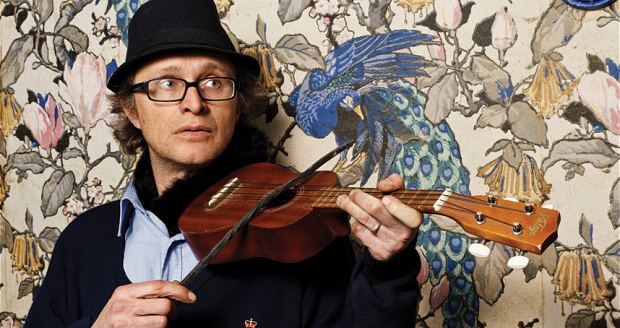 As well as throwing in a few Caine impressions (and a pretty good Johnny Rotten), Munnery starts to use Kierkegaard’s more well known sayings as a handy jumping off point to explore more wide ranging topics, like Vladimir Putin and the fact that William Shakespeare needed to get out more. The show definitely picks up in the second half; the more baffled looking members of the audience perk up a bit and are rewarded with some hilarious punk rock riffs on the topic of modern day apathy and Kierkegaard’s row with a gossip magazine from 200BH (Before Heat). On the whole, though, Munnery seems a bit overwhelmed by the scale of the task he’s set himself, a bit like a student who forgot to revise for an exam. The show is quite disjointed, lacks and ending and bounces around quite a lot without ever finding a sure footing. There’s every chance it will get better as the Fringe goes on and the drier Kierkegaard sections will probably become more neatly woven into the fabric of the show, but if you prefer belly laughs to learning about long-dead Danish philosophers then there’s a chance this show might not be your cup of gløgg.